Do you find yourself battling high humidity levels in your home every summer? There are various things that can play into this, one thing we’ll key on here is your cooling system. Why? Because your air conditioner doesn’t just cool your home, it conditions your home which includes dehumidifying your home, or at least it should. There things that play into if this is being done, like sizing. There are also cooling systems with components that allow them to do a better job at dehumidifying than others. Have you ever taken the time to look at the setup of your homes heating and cooling system? Next time you visit your utility room or change your furnace filter this summer take a look at how things are setup. Not every system is the same, but there are usually similar components within a system. We’ll use a gas furnace and air conditioner combination as our example. With this particular setup there is a a heat source (gas burning), a evaporator (cooling) coil, blower fan and an air conditioner condenser. 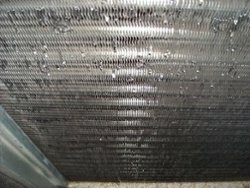 The evaporator coil is typically found in a case or box resting directly above your furnace. From this box you will see copper refrigerant lines and a drain line typically made of a combination of PVC and clear flexible tubing going to a drain. In the heart of a humid Lincoln NE summer you should see plenty of water flowing down that drain. That water is the humidity from your home that has condensed into water after passing over the cold evaporator coil. This is part of the cooling process that you don’t always think about and can only happen when the system is cooling. If an air conditioning system is over sized your home runs the chance of being more humid because that system will reach your thermostat’s cooling set point too quickly to be able to do a good job of ringing out the humidity from the air. Another reason why bigger is not always better when you talk cooling capacity of your home’s cooling system. If you are looking at the replacement of your home’s heating and air, it’s worth asking for options with multiple speed or variable speed components. Why? These systems have more flexibility with air conditioning and heating, and will provide better comfort because of the flexibility. In cooling season especially with certain thermostats the lower speeds of a multiple speed system can be utilized to pull additional humidity out of your home’s air. Bryant Evolution system takes this to a whole different level. 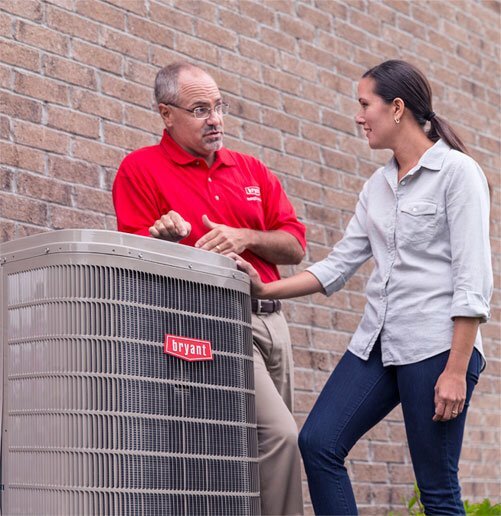 Bryant Evolution heating and cooling systems utilize variable speed components along with a smart communication system bringing the furnace, air conditioner and thermostat all together into one optimal dehumification machine. You the homeowner can tell the Evolution Connex thermostat to keep your home’s humidity level to a certain level and it will do the rest of the work. If your thermostat’s cooling point is reached, but there is more humidity that needs to be pulled out of the air, the Connex will run your system at the lowest speeds to dehumidify more while making the smallest difference in your homes temperature level. What this means for you is a more comfortable home year round. Bryant offers free estimates for heating and air systems. To schedule a free estimate and to learn more about systems that will help keep your home’s humidity levels at bay call Bryant 402-470-8162.